← Is there water in the pool? My heart goes out to you at this difficult time. We have two wheaten terriers, Teddy (8) and Shayna (2) and have had others before them whom we needed to part with..sadly. Our pets seem to wrap themselves around our hearts in a unique way. You were so fortunate to have Mac and Ella in your lives and I feel certain you made their lives rich with love, too. It seems silly to say, but time does help to heal. Just know that lots of us understand your pain. This cyber space can be a great way to communicate about life and knitting! Be well and know we are thinking of you. Thanks for your wonderful words. Wheatens are so wonderful, too. When I get back from this trip I’m about to take, we will begin our next dog search in earnest. I’m giving a lot of thought to what sort of dog we should share our life with next. We love border terriers—-or at least we loved Mac and Ella. We will look to see if we can find a border who is beyond the puppy stage, house broken, and in need of or available for another home. 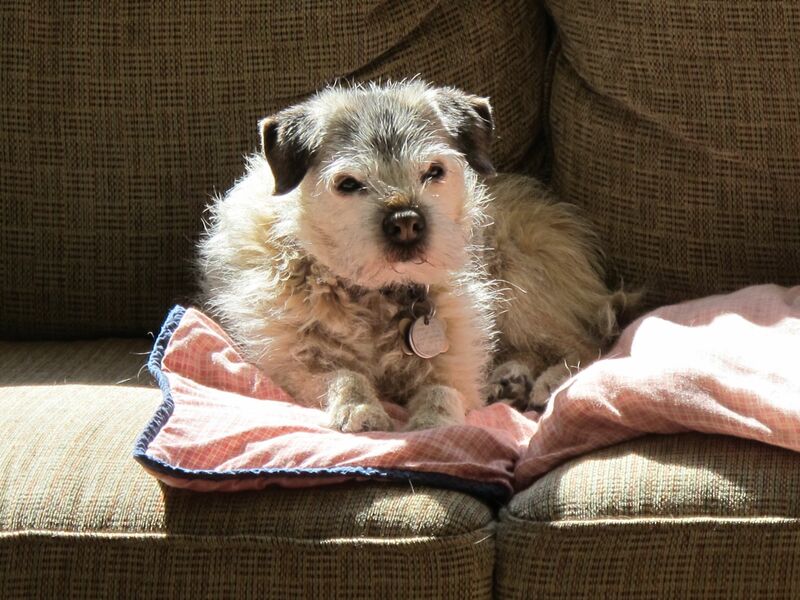 Given that we have recently grieved their loss, I don’t think we are ready to take on some very senior dogs, although I learned that senior dogs are so special and so very sweet. 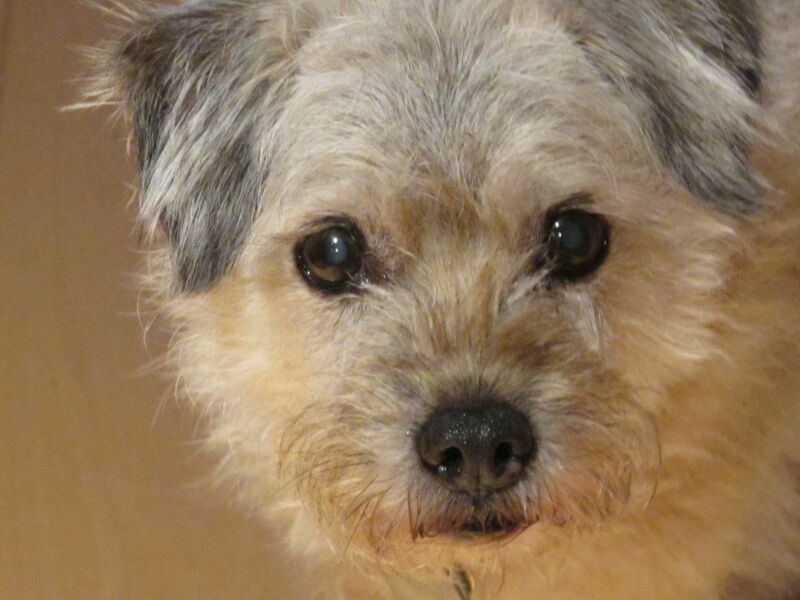 We will probably be looking for a puppy quality border a couple of years – 5 or 6 years old. And we’ve also seen some interesting poodle-terrier mixes that we want to check out. We know that whatever we end up with, it must have some terrier in it. Mac and Ella were the first terriers I’ve ever had—–and what wonderful and devoted dogs! When my darling Mandi became ill it was the most painful decision of my life to let her go. I still miss her every day. A friend lost her little fur baby yesterday. This is what I told her. “We give the gift of immortality to those we photograph. Through pictures and memories, those we love live with us forever.” Bailey was a Maltese. A 13 pound Maltese. Whenever she had him groomed, she saved his hair along with the hair from his brother Beanie (a Coton de Tulear). She had it spun into yarn which became a sweater for Bailey when he finally had to begin wearing his hair very short. It is a beautiful soft white yarn and made the most amazing little sweater! So happy to have you blogging again! Good for you that you’ve been saving beautiful Maltese hair. My daughter had a Malamute-Samoyed mix for 15 years, from the time she was 15 until she was 30. He was such a wonderful dog (maybe I need to blog about him and the yarn spun from his undercoat sometime! ), and “his yarn” is lovely. It’s an interesting idea to spin a dog’s undercoat into yarn to be made into a sweater for the dog when he’s wearing his hair short!! Keep watching and waiting. I did get a few nice pictures of Ella—-although she had an uncanny knack for recognizing a camera—even when I thought I was concealing it behind my back! I’m so glad you’re back to blogging and so sorry for the loss of your little friends. For a long time after we had to let our two basenjis (Obi and Maija) go I would hear their toenails tapping on the floor, or the slap of the flap on the doggie-door. I could sense them still around and would look to the floor before turning in case they were underfoot. It has been 5 years now since Maija died and we haven’t replaced them. I do miss the unconditional love and their snuggly warmth. I know what you mean. Every time we drop a crumb on the floor or a little piece of food, it occurs to both of us that we’d better just pick it up as there are no furry ones with good noses who will rush in to clean it up! And we, too, occasionally hear them. Also, although it’s sort of nice to not have fur balls floating around, when we do see a larger than usual dust farfel, it takes us back to when they were with us and regularly dropping them everywhere! I can see how time can pass quickly and suddenly years have gone by since the loss. Initially my husband said, like Poe’s raven, “nevermore.” Then he said he’d made a decision: “This time we’re only getting one.” Stay tuned! I am so sorry for your and your family’s loss – saying goodbye to a pet is so hard but hopefully you can find comfort in the memories of the years you shared with them. We did and 4 months later we “adopted” a 5 year old female border terrier, Fennel, whom we loved and had for 5-½ years before losing her to cancer. It was another heartbreaking experience, but in retrospect again, we agreed that the joy much outweighed the grief and we have so many happy memories. We now have another female, “Mimi,” who was 18 months old when we adopted her 18 months ago. What a joy she is to us…..so lively and really keeps us on our toes. We love her very much! I have been concerned about you, given your absence from your blog, and now I know it was with good reason. Thank you for sharing your experience. I too am facing that decision soon for my beloved West Highland Terrier, and know that I am measuring his remaining life in days now, not years. Nothing will ever erase the joy he has been to me, and I love him too much to let him suffer. What a responsibility we take on when we choose to let a pet into our lives. I will be thinking of you. Thank you also for the pictures; those dogs are still bringing joy to others! Bless you. I know how difficult it is to make the difficult decision that is soon to face you. It’s all about putting those we love first—and it’s still hard because we love them and don’t want to lose them and suffer the pain associated with that. And yes, you will always have the joy and wonderful memories. We were fortunate to have understanding friends and family, who understood and didn’t minimize our loss because “they were dogs.” Hopefully you have a wonderful vet that you trust who can help you navigate the difficult path you are on. Belated thanks for your concerns. As I mentioned in another reply to Laura above, I stopped and then didn’t get back into the blogging habit again. But I’m ready to do it again. Wow! How fast 8 years pass! I am so sorry for you huge loss. The love of a dog makes such an impact on your life. I’ve worried about you, though I don’t know you, I enjoy your blog so much and there was a hole for me when you stopped writing. You are making a positive inpact on this earth. Hope you find a way to adjust and keep walking even though the two motivaters are walking elsewhere. Peace for you. Thanks for your wonderfully supportive message—and I’m glad that you’ve enjoyed the blog. We’re getting there. My life has been measured by a number of wonderful dog relationships. And we’re looking forward to finding the next special furry soul to share our home and lives with. It’s so much better to knit with a warm, furry body tucked in beside you! Betsy, I’ll really miss seeing your dogs take you walking about town. Have good memories and take care. Stay tuned! When I get back from trip to Europe with daughter, the dog search will get into high gear……and then sooner rather than later, you’ll see us walking the next dog child.